It's the name that thrills. A name that smacks of risk, for a fruit dark and pungent. This one has a stippled skin with a golden seam running down one side. The sunset tones look as they've been airbrushed on. The livid freckles are too small for freckles, more the pores of human skin, inflamed with a deep red rash. 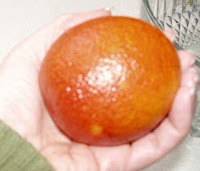 Chilled from the fridge, the fruit fits perfectly in my hand, and the nub of a stem sits in one end like a clove stud. That's just the outside. Take something out of the fridge and write about it.